So you have just landed at Panama City’s Tocumen International Airport and can’t wait to get into town and start exploring (or go to bed). The most easy way is to grab a taxi, but what if you are a backpacker or simply not willing to spend fixed $30 on a 25km cab ride? I have listed two alternative options for you, including public transportation (Metrobus) that can take you into town for only $1.25! I don’t mention Uber here (which has a flat fare of $25) since it can be tricky to coordinate where to meet the driver if you don’t have a local sim to call. If you are traveling alone (like I did), you can choose to take a colectivo. 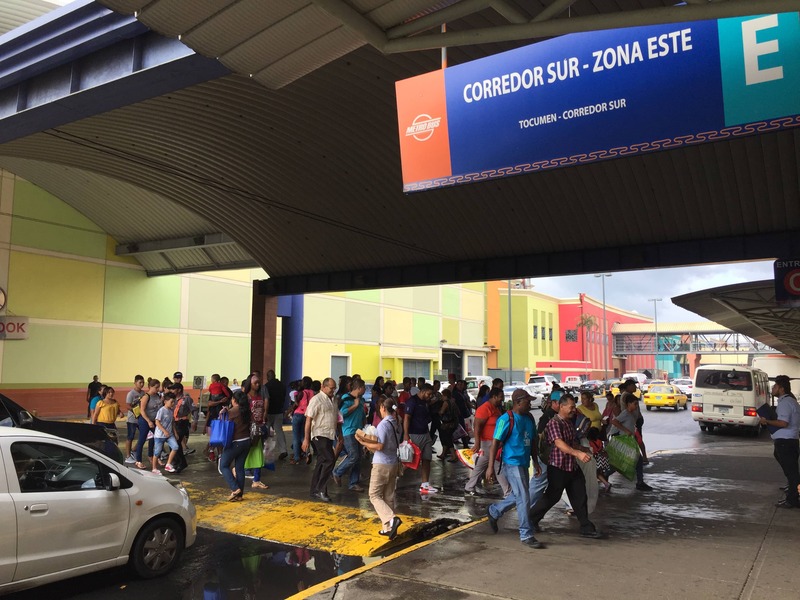 Simply walk out of the arrivals area to the official taxis (you will see a line of several white minivans) and ask for a colectivo. This shared minivan will drop you off at your hostel or hotel: however you might need to wait until there are at least two other passengers. If the staff tries to charge you anything more than $15, stay friendly and just point at the official sign sticking to the wall which says $15. Honestly I did not have any problems here, the taxi staff was very helpful and within 10 minutes I was on my way to town! Note that this bus is not a designated airport bus, and luggage storage is therefore limited. I actually used this option to go from Panama City to Tocumen Airport as I was more familiar with the city and Metrobus system by then. First of all, this route is a bit of a hassle if you have just arrived in Panama after a long flight, and speak limited Spanish. It involves a 5 to 10 minutes walk and since you need a Metrobus card (which is – how convenient – not for sale at the airport), the only way to get on this bus is to ask fellow passengers that have a Metrobus card to swipe their card for you. Obviously you should at least pay them the cash fare in return. Once you exit the arrivals area, turn right and walk alongside the terminal building. At the end you will see a sign that says “public transportation” with an arrow pointing at a small restaurant (or convenience store?). The sign pointing you to go straight ahead for public transportation. As the sign says, just walk straight. 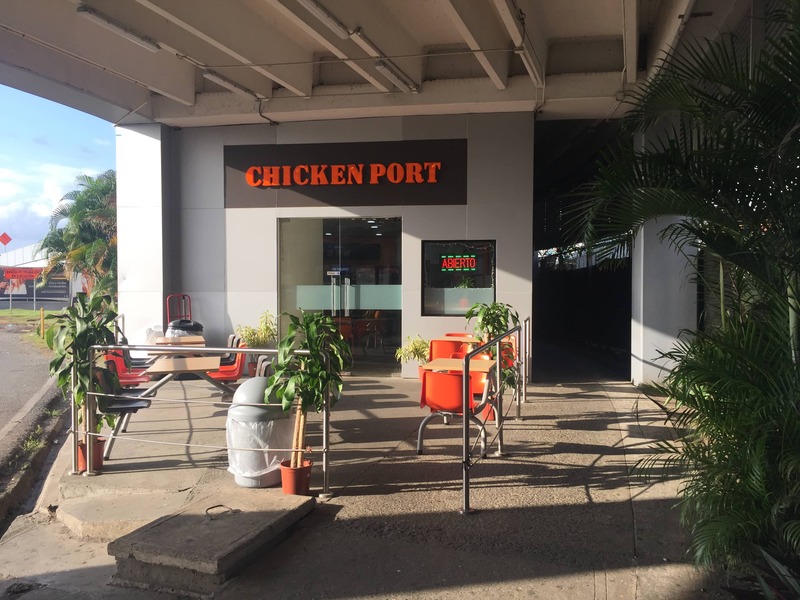 That is: do not follow the main road, but keep right at the Chicken Port (restaurant?). You will see the small alley as on the pictures below, walk in to the alley and go straight. Keep right and walk into the dark alley. You might think that you are not supposed to go here, but it’s the right way for the $1.25 bus! It’s actually not as dark as it seems, and there are lights that (should) turn on at night. At the end of the alley you will see a parking lot. Below two pictures are actually taken in the opposite direction, as I used this route when I went from Panama City to Tocumen Airport (the other way around). Either way, just follow the covered walkway and you cannot really go wrong from this point. The walkway leads all the way to the main road. 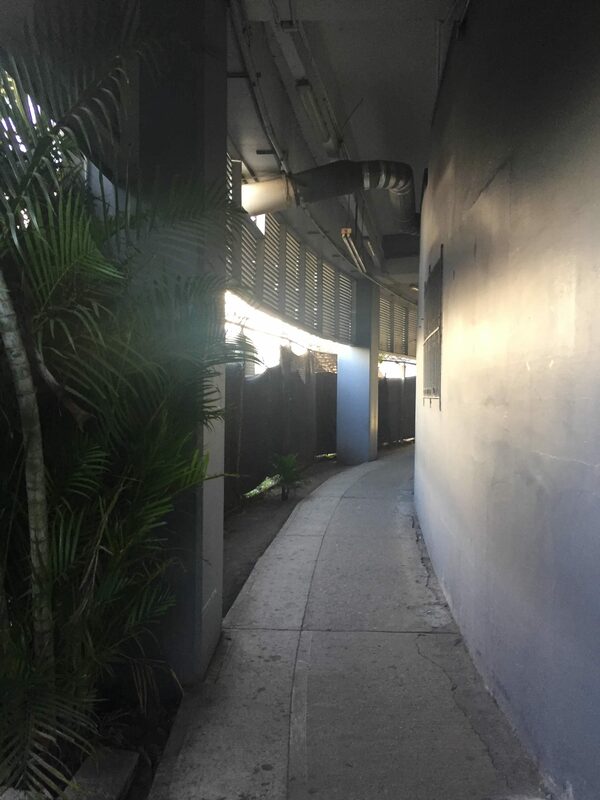 The other side of the alley leading to the terminal. 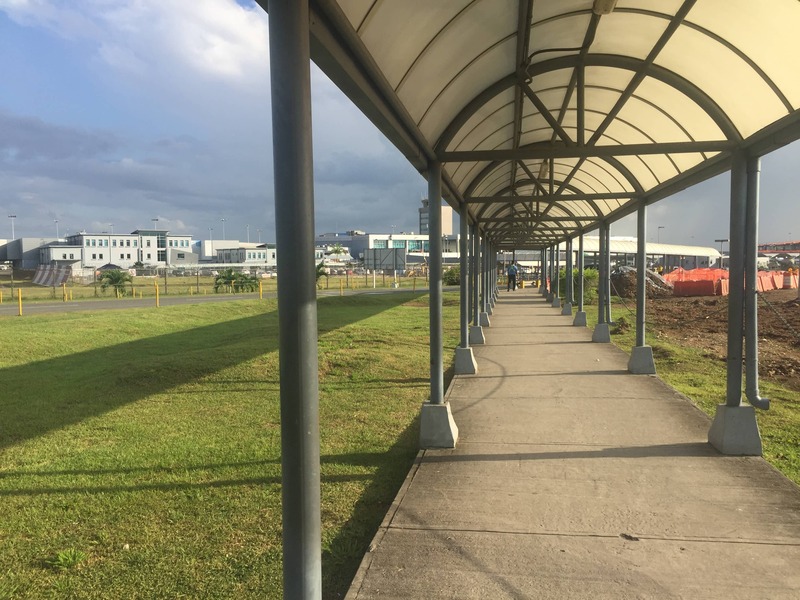 Follow the covered walkway to the bus stop. Walkway from the bus stop to the airport. Once you see the main road there is a bus stop located on your right: this is the stop for buses going further to Tocumen. Instead, cross the main road to go the bus stop on the other side with buses going to Panama City / Albrook. Cross this road and follow the walkway to the bus stop in the direction of Panama City. From here, just wait until the Metrobus shows up. Take any Metrobus that says “Albrook, Corredor Sur” to go to Panama City. Corredor Sur means that the bus is taking the highway (it’s actually pretty fast if traffic is ok!). Once you reach the city you can get off at Multicentro (close to the Hard Rock Hotel, El Machico and a bunch of other hostels), along the coastal road Avenida Balboa (Cinta Costera), or go all the way towards Panama City’s transportation hub and shopping mall: Albrook Terminal. 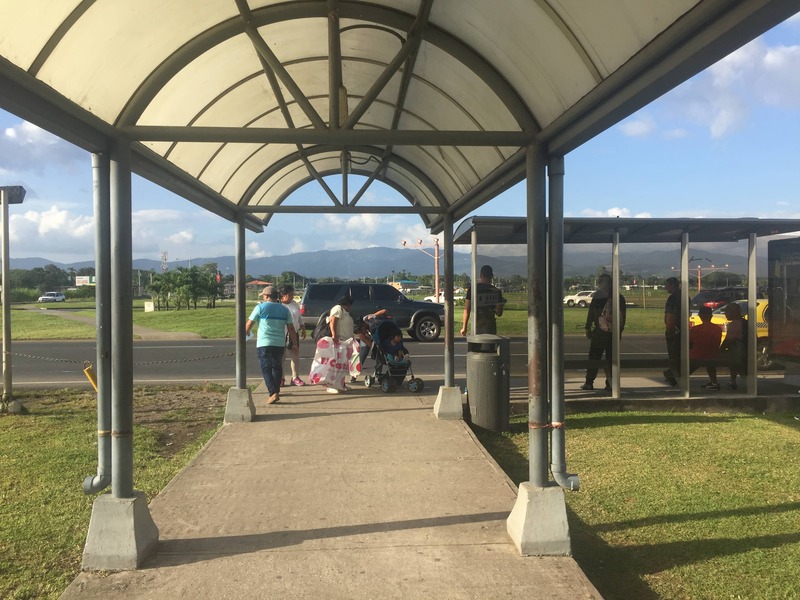 Tip: make friends with locals that are also waiting for the Metrobus to Panama City, and ask them if they can help you to swipe their Metrobus card in order for you to get on the bus. In Albrook you can transfer to the Metro, almost any Metrobus line, or take a taxi to your final destination. 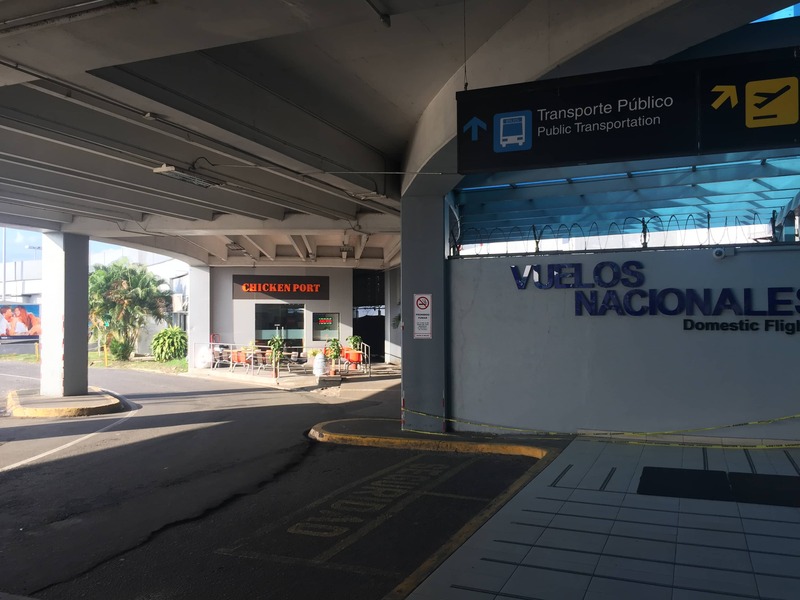 Note that if you are planning to use public transportation in Panama City more than once, you can also buy a Metrobus card that works for both Metro and Metrobus at the Albrook Terminal for $2. Make sure to check out my Panama City Travel Guide to find out where to go in Panama City. 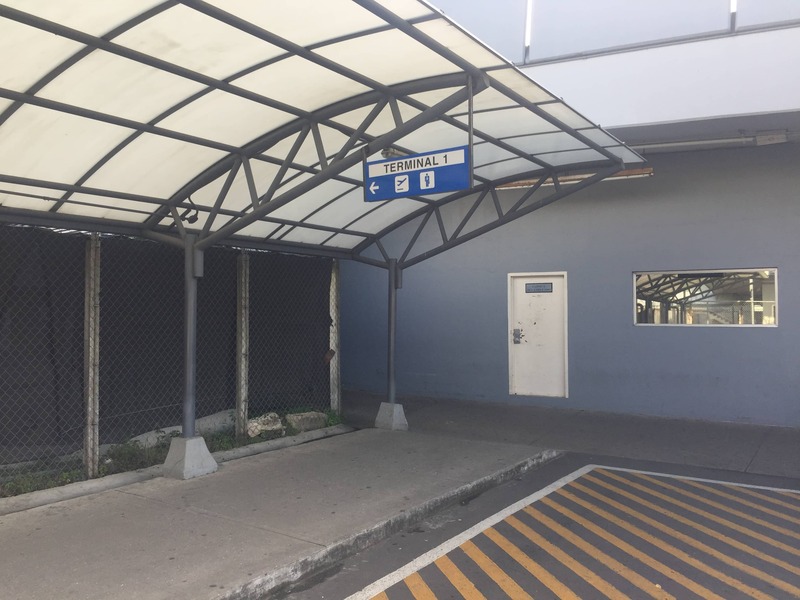 If you are going from Albrook Terminal in Panama City to Tocumen Airport by bus, board the bus at platform E.
The location of the bus stop towards Tocumen Airport in Albrook Terminal. Thank you very much Michiel for your lightning fast answer! Do you remember how long the journey took from albrook to the airport? More than 30 minutes? No problem, I believe it was about 45 minutes but it depends on traffic, also you might have to wait up to 30 mins to wait for the bus to depart. Hence I would calculate 1.30hr for the entire journey including waiting time to be on the safe side. Worked like a charm today! You’ll be able to spot the “taxi line” outside of Door 5 or 6. The drivers wear polos with the Tocumen Airport logo and don’t forget cash (small bills or exact change). Honestly I don’t dare to confirm that, but I believe as long as there are flights arriving there should be colectivos as well. You might have to wait a bit longer though. Thank you for the super helpful post. Just wondering, is a collectivo $15/passenger or is it $15/hotel drop? I’m travelling with my partner. Thank you in advance! Hi! It was 15USD per passenger, maybe you can negotiate if you are two though since otherwise there won’t be an advantage taking a colectivo over a normal cab. I’m going on my own to Panama in january and thinking about going directly to bocas del toro when landing in Panama City, but need to change airports…is the colectivo an option if you want to go from tocumen to albrook as well or does it just go downtown to hotels/hostels? Or would you recommend a cab in that case? How exciting you are going to Panama! Is that to Albrook airport? Although I’m not sure I think you should be able to find a colectivo for that, as Albrook is really close to the center. Hello Michael: We have an 18-hour layover in PC (arrive 3:00pm and depart in the morning). What suggestions do you have for touring, entertainment, etc.? Hi Michiel, the Metrocard for $2 can be put more money in it for next rides, right? How does it work? I must comment on this Post! wow! this right here is what in Los Angeles call “A-1” top of the line information! You literally held our hand and walked us thru it, and its funny because as I am going step by step , lol, I can tell you that on Feb2nd 2018, it took me about 15-20 minutes to figure out that same route and then I still got hit for 25$ because I just didnt have enuff “sure-shot” insight and info to “Take that ride (ie:Survival car insurance commercial)”… I am on my way out there tomorrow and I booked a flight to Colombia but I have to get to Albrook airport….So on that note, super good looking out bro! Michiel Thank you so much for your detailed and super helpful post. Next week Me and my wife will arrive Panama City for Vacation and I was thinking US 30,00 is so expensive for one way travel from airport to city.